Audi has confirmed the new 2014 RS 7 Sportback will be headed to U.S. shores with a powerful twin-turbo V8 while making its debut in Detroit. We have heard for awhile now that Audi planned to make the new RS 7 Sportback available here in the U.S., and the German automaker has confirmed the new high-performance model will be headed to North America. The all-new Audi RS 7 Sportback made its debut at the North American International Auto Show 2013 in Detroit with much fanfare. The large five-door coupe is unique and features enough power and performance to satisfy the most diehard performance enthusiast. While the new RS 7 will share the same twin-turbo, 4.0-liter TFSI V-8 engine with the performance Audi S8 sedan, the output is bumped to 560 horsepower and 516 pound-feet of torque. That’s a nice gain of 40 horsepower and 35 pound-feet of torque over the already potent S8. And the new RS 7 will launch from zero to 62 mph in just 3.9 seconds, with an electronically governed top speed of 189 mph when equipped with the optional dynamic package plus. That should satisfy most driving enthusiasts here in the U.S. if they can find a track long enough. And if you are concerned about fuel mileage, the new RS 7 will get 24 mpg highway. But good luck in keeping your foot out of the throttle to achieve those numbers. Audi uses their latest engine technology that has been developed from their racing experience. It starts with a twin-turbocharged V8 that features a unique cylinder head design. The heads have the exhaust side on the inside and the intake side on the outside and the two twin-scroll turbochargers are located together with the intercooler in the inside V of the cylinder banks. Along with the RS-specific engine management and unthrottled intake system and optional sport exhaust system, the RS 7 is responsive. Another notable feature is the RS 7’s cylinder on demand (COD) system. Audi says, at low to medium loads and engine speeds, it deactivates cylinders 2, 3, 5 and 8 by closing their valves via electromechanical actuators. The 4.0 TFSI then runs as a four-cylinder engine until the driver accelerates more strongly again. The operating points in the active cylinders are displaced toward higher loads, increasing efficiency. The powerfurl twin-turbo V8 comes mated to a standard eight-speed tiptronic automatic and comes standard with quattro permanent all-wheel drive to keep all four wheels firmly planted on the pavement. Drivers can choose between the modes D and S or change gears themselves using the shift paddles on the steering wheel or the selector lever, which sports a unique RS design. It features short lower gears and an eighth gear that is tall to reduce fuel consumption when cruising at higher speeds. The five-door high-performance coupe comes standard with polished, seven twin-spoke 20-inch forged lightweight wheels, and optional 21-inch cast wheels in a choice of three designs are available. The Audi RS 7 Sportback will stop quickly by using four internally vented discs featuring a weight-saving wave design and measure 390 millimeters (15.35 in) in diameter up front. The sporty Sportback also comes equipped with air suspension, which lowers the body by 20 millimeters (0.79 in). Audi also offers the tighter sport suspension plus with dynamic ride control (DRC) as an alternative to the air suspension. It uses steel springs and three-stage adjustable dampers that are connected via diagonal oil lines and a central valve. As with most performance automakers, the body of the Audi RS 7 Sportback uses weght-saving techniques and includes up to 20 percent aluminum and includes many parts of high-strength and ultra high-strength steels. It not only saves weight but is rigid to produce precise handling and a quiet cabin. Outside, the new RS 7 Sportback gets distinctive bumpers and a high-gloss black protective grille with honeycomb structure at the front of the car as well as add-on parts in matt aluminum. At the rear of the car, the performance car features a power extending spoiler, diffuser and the two large elliptical tailpipe trims of the exhaust system can be seen coming out the back. The cockpit of the Audi RS 7 Sportback features distinctive dial instruments with black faces, white scales and red needles, and a 3D RS 7 logo in the tachometer is added for further effect. The flat-bottomed, three-spoke leather steering wheel, and illuminated door entry sills and the displays for the MMI and driver information system sport RS badges complete the sporty interior. RS sport seats with extra side bolsters, integrated head restraints and RS 7 logos are standard. The RS 7 Sportback sits at the top of the Audi range and the list of standard features is extensive. It includes features like HID headlights, Audi’s parking system plus, tri-zone climate control and an Audi-developed audio system. It has optional features like a heads-up display, a comfort package, a Bang & Olufsen audio system and Dynamic and Dynamic Plus packages. Audi has not released details on pricing and availability here in the U.S. market but will be expected closer to the RS 7’s launch. 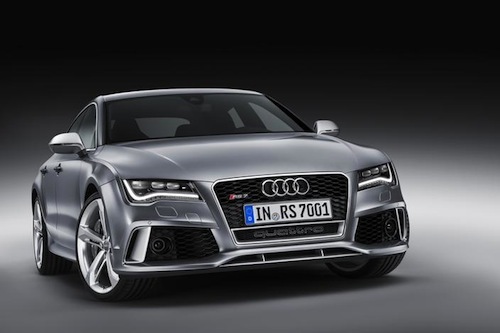 Look for the new high-performance 2014 Audi RS 7 Sportback to be launched later this year.